A stirring account of one female athlete’s struggles in an arena defined by males. Heywood, a professor of English (Binghamton Univ.) who has written on feminism and women’s bodybuilding, graphically describes her early years as a long-distance runner: Plagued by eating disorders, exercise compulsion, and amenorrhea (and resulting bone loss), she suffered from what later became defined as the “female athlete triad.” Always striving for perfection, she thought that refusing food was a virtue and exercising beyond endurance was one more victory. Winning a race brought recognition and transitory fame, but ultimately it brought emptiness. Yet Heywood could not free herself of her self-destructive determination to win at any cost. Particularly disturbing is her depiction of the sexual abuse she experienced at the hands of her coach, who resented a female who could successfully compete with his boys on the high school cross-country team. The message that she received from him was, “You’re a girl, so you’re garbage, not an athlete, no right to be here with my guys.” She believed it for too long because she seemed to be always on the run from the female role that her mother assumed throughout her loveless marriage. 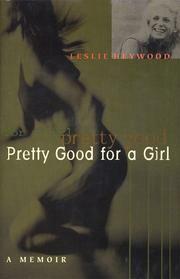 If her powerless mother was worthless as a female, Heywood reasoned, she would redefine femininity by escaping from it and becoming “one of the guys.” Only when on the verge of a life-threatening physical and emotional collapse could Heywood begin to assess the traps to which she had succumbed. Ultimately, the author triumphs because her insights allow her to finally accept her limitations and define herself as a woman and athlete without the self-destructive need to win at all costs. A rousing critique of what can go awry in the world of women athletes and a passionate plea to value sports for the sense of competence they can so often bring to young females.